Back in November 2009, I got to go back to my old stomping grounds in Phoenix, Arizona. While I was waiting for my flight home, Southwest Airlines’ New Mexico liveried jet pulled up to the gate. Enjoy! I lived in Phoenix from June 2001 to December 2002, when I worked for Mesa Air Group. I went back to Phoenix in March 2008 for an airports conference and spent some time taking photos of the US Airways fleet. And since that livery will eventually only be a memory, I thought I’d start sharing some of the ones in my Flickr collection. Enjoy! Kids: Aunt Benet is a bit tired and way behind on other work today, so you get this best-of, which first appeared on the blog on Dec. 18, 2012. Enjoy! “Quilted Passages” By Lillian Blades, at Hartsfield-Jackson. I’ve always been a fan of art. My love affair began in 6th grade, when my art teacher, Miss Sappington, introduced me to Henri Matisse, Paul Klee and Edward Degas. I bought — and framed — my first piece of art when I was 16. And I’ve always been a big fan of airports that display art. So I was taken aback when I saw this article in Salon – Why Is Airport Art So Lame? The author contends that airports have to appeal to such a large group of people who choosing art can be tricky. Below are four airports I think are doing a great job with their art programs. San Francisco International Airport. my original hometown airport has always been the gold standard to me when it comes to art. This museum is so good it received accreditation from the American Association of Museums. Among the exhibits I enjoyed in 2012 were: blue jeans maker Levi Strauss advertising as art; pilot equipment of the open cockpit era; early Lockheed aircraft; sewing in the machine age; and 75 years of the Golden Gate bridge. Miami International Airport. If SFO is my gold standard, MIA is a close second. Back in August 2007, Aviation Week sent me down to do a preview of the South Terminal, which was in the final push to open (read my blog post here). I spent a morning with Yolanda Sanchez, the facility’s director of Fine Arts and Cultural Affairs, who showed me a great collection (my Flickr collection is here). Hartsfield-Jackson Atlanta International Airport. I lived in the city for two years when I worked at Delta Air Lines. I just loved going to Concourse E, the international terminal, just to see the art. There were art displays that represented the city’s place in the Civil Rights movement, including items from the MLK Museum. But as a quilter myself, I loved seeing the airport’s wonderful collection of art quilts. Phoenix Sky Harbor International Airport. I was passing through Sky Harbor back in the day and had some time to kill. I found myself in the Terminal 4 gallery which had a wonderful display on the art of baseball. Artists used their media to represent what baseball meant to them. 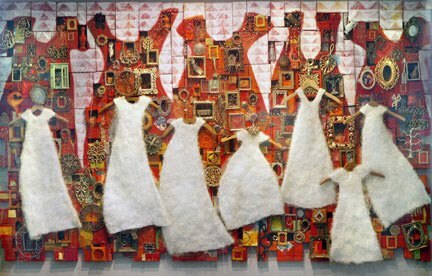 I would love to go to Terminal 2 to see the display of fiber art. So — what are your favorite airports for art? It’s Valentine’s Day and we see the joining together American Airlines and US Airways into what Reuters is calling the “world’s biggest airline.” So to celebrate the lovebirds, I’m posting a photo I took of some US Airways jets parked at the gate at Phoenix Sky Harbor Airport back in April 2008. Enjoy this livery while you can! !